The Learning Place in New Jersey cares for children from 2 months to 6 years old. At the very first learning session of the Collaborative, the staff found out how to provide optimal and appropriate accommodations for breastfeeding within their program. 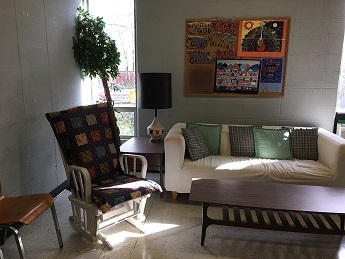 The staff quickly recognized that their early care and education (ECE) center did not provide a quiet, private and comfortable space for moms to breastfeed their babies if desired. In the past when a mother wanted to breastfeed her child, she would sit in the classroom of 12 infants and cover herself for privacy. This was clearly a problem. Soon after identifying this area of improvement, they began setting up an appropriate space. The school is located in a Methodist Church; therefore, they were required to run such changes through church trustees. Once they were permitted to use the space, they purchased furniture and other decorative items for the room. They also displayed information sheets and resources for breastfeeding moms. At this time, the staff at Learning Place are happy to work on other action plan goals such as creating water zones, increasing physical activity and encouraging healthy eating in their program. Child Parent Centers, Inc. (CPC) Early/Head Start of Southern Arizona are currently working with approximately 40 child care sites throughout five counties to create breastfeeding-friendly environments in each center. CPC has created a breastfeeding subcommittee, and they plan to purchase equipment needed for each site and constitute a breastfeeding policy. Provide this pamphlet to parents in your breastfeeding area. This guide from La Leche League describes different types of pumps, and how to make pumping as comfortable, effective and stress-free as possible.